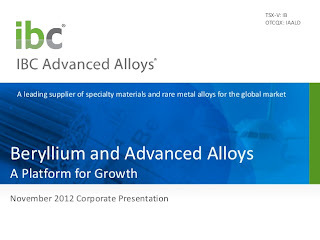 IBC Advanced Alloys Corp. (TSX VENTURE: IB)(OTCQX: IAALD) ("IBC" or the "Company") announces that its wholly owned subsidiary, IBC Engineered Materials Corp., a leading supplier of high performance aluminum beryllium alloys and advanced castings, has earned its AS9100 Rev C certification through Intertek, an internationally-recognized independent auditor of industry regulations. Developed specifically for the aviation, aerospace and defense industries, AS9100 ensures the safety and reliability of products used throughout these markets. The AS9100 Rev C standard was established by the International Aerospace Quality Group (IAQG) to help achieve significant quality improvements throughout the industry and is recognized globally with many prime aerospace contractors now requiring AS9100 compliance from their suppliers. "Compliance to AS9100 Rev C is a confirmation of quality to aerospace and defense customers," said Ray White, President of IBC Engineered Materials Corp. "Industry-specific standards, like AS9100, help manufacturers monitor critical cost and time-to-market factors, while ensuring customers get the best quality products available and it is confirmation of IBC's commitment to superior service and products for its clients." Anthony Dutton, IBC's CEO commented, "AS9100 certification is critical to our evolving business objective to be a volume supplier of specialized components and advanced castings to the aerospace sector. Until now, sales of Beralcast(R) castings for aerospace applications have been based on its extraordinary mechanical properties and cost-effectiveness. It will be much easier to achieve volume sales now that we have industry-standard certification of our processes." As part of the AS9100 certification, the Company has been certified to the latest ISO9001:2008 standards as well. IBC Engineered Materials Corp. is also listed in the OASIS (Online Aerospace Supplier Information System) database, managed by the International Aerospace Quality Group (IAQG). Sponsored by three governing bodies - the European Association of Aerospace Industries (AECMA), the SAE International and the Society of Japanese Aerospace Companies (SJAC) - the IAQG is a cooperative of worldwide prime aerospace industry companies that jointly develop standards for high quality products. "Customers in other sectors are guaranteed comparable quality assurance through accreditation and AS9100 certification," White said. "This certification strengthens our competitive position with an objective standard for quality, customer satisfaction, and on-time delivery across the board." Concurring with White, Tobias Rodill, Managing Partner of Washington DC-based Command Strategies said, "The awarding of an AS9100 Certificate of Registration is an important milestone for IBC, and we are looking forward to leveraging this essential certification as we continue to raise IBC's profile in the aerospace and UAV communities to advance its business development initiatives in these sectors." IBC's Engineered Materials is the world's only producer of precision aluminum beryllium investment castings known as Beralcast(R) alloys. The Beralcast(R) range of alloys and composites has a consistently high stiffness to weight ratio which allows aerospace, automotive and high tech engineers greater design flexibility and more options for significant performance gains including dramatic weight savings. The Beralcast(R) family of alloys are ideally suited to commercial, electronic and military aerospace applications requiring complex, lightweight high modulus parts. IBC is an integrated manufacturer and distributor of rare metals (beryllium) based alloys and related products serving a variety of sectors including aerospace, automotive, telecommunications and a range of industrial applications. IBC has 86 employees and production facilities in Indiana, Massachusetts, Pennsylvania and Missouri. 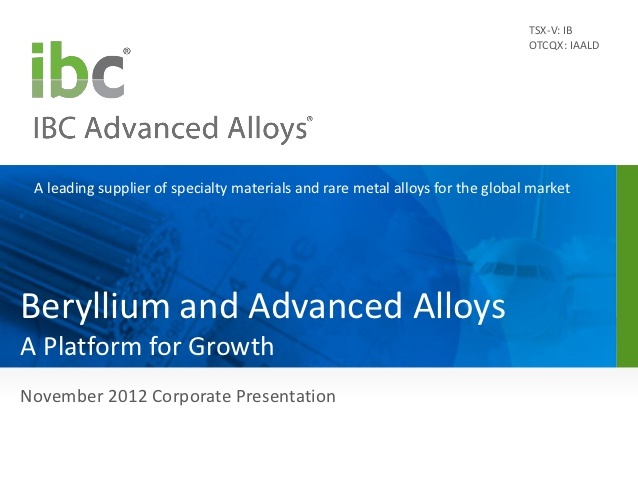 IBC is creating a dynamic global advanced alloys company. IBC's common shares are traded on the TSX Venture Exchange under the symbol "IB" and the OTCQX under the symbol "IAALD".